Just reduced rates for last minute discount. From nights of April 28 thru May 2 rates are reduced from $170 per night to $120 per night with three night minimum. For the May 3-4 weekend, rates are reduced from $200.00 per night to $170 per night. Located at the edge of the Chattahoochee National Forest halfway between Ellijay and Amicalola Falls, Paramount Place is an absolutely gorgeous, custom, executive home on three acres with a 200-degree mountain view that overlooks the Cartecay River Valley. 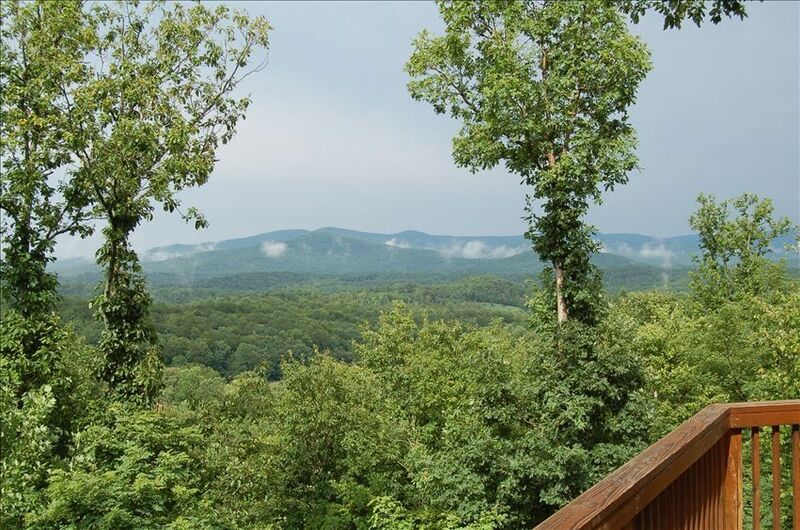 Paramount Place is very secluded and private, yet only 12 miles from the Ellijay town square. The Ellijay town square has antique shops, art galleries, specialty shops, and a variety of interesting eateries. Ellijay is also the apple capital of the North Georgia Mountains and has an Apple Festival every fall. Paramount Place is conveniently close to prime mountain bike trails, hiking trails, whitewater rafting and canoeing on the Cartecay and Toccoa rivers, Amicalola Falls, and the Appalachian Trail. Paramount Place is a great mountain getaway with 2800 square feet. It has three bedrooms, three-and-one-half baths, with a wraparound deck to take full advantage of the magnificent mountain view. Fifty-one windows and four large sliding doors provide panoramic views from every room. Ideal for two to three families, extended families, small reunion gatherings, or just a couple that likes a lot of space. Perfect for a small wedding, wedding reception, honeymoon, or all three! IThe great room has 25-foot ceilings in white pine with three stories of windows, a stone fireplace, and a satellite-fed full home theater set up. Watch the football game, the fire, and the mountains from the leather couches. Enjoy the Dolby 5.1 surround sound system powered by a 100-watt per channel Yamaha Digital receiver and Samsung DVD player on the 36-inch JVC TV. All rooms have 27 inch satellite TV with Combo DVD/VCR. You will find a dining room and a large, well-designed, fully-equipped kitchen with upgraded appliances and maple cabinets. Master has a king-size bed with a double whirlpool tub with double shower with two valves. All plumbing fixtures are solid brass. Second floor has two lofts with 17-foot ceilings with a connecting gangway. The North loft is home to an eight-foot solid maple Connelly pool table or cross over to the East loft and curl up on one of the two Lifestyle, queen-size futons with upgraded nine-layer mattresses and read a book. Each loft leads to its own bedroom with connecting full bath. The gangway between the lofts has a brand new Desk and Chair, Dell Pentium 4 computer, 17 inch monitor and printer. We have also just installed high speed internet access (DSL) and a wireless network. Bring your laptop and on the deck and enjoy the view while you work or play on the net. Enjoy the Vita Spa, six-person, hot tub from the private deck, strategically placed to provide privacy and a panoramic view. For total comfort you will find a Carrier, four-zone, central heat and air system. Children will find a Creative Playthings play set with fort, rope ladder, slide, and a variety of swings for ALL ages the yard with a view second to none. Guests can enjoy a game of basketball on our 26-foot by 32-foot basketball court. A Foosball table is also provided for your enjoyment. Try a fire under the stars at our outdoor fire pit on the lower terraced level with room for tents. Seasoned hardwood firewood is provided for both the fire pit and the fireplace in the Great Room. Parking for eight cars on the concrete driveway and a Bermuda-sodded front yard finish off the package. The Paramount Place is fully furnished with all linens, dishes, and appliances required for a hassle-free weekend in the mountains. Perfect getaway for someone who wants to enjoy the mountains without giving up the luxury of home. We highly recommend you read the guestbook! (See link below with over 80 comments...) Our former guests are truly the best form of advertising we have. Many thanks to those who have left the very nice comments about our home, the view, and the area!! We designed and built this home as our 'dream home' that we would spend the rest our lives in. Little did we realize how children can change your outlook on what is the 'perfect' place to live. The home took us three-and-a-half years to construct and we did most of the work, camping on the property while we built. It is truly a unique property like no other in the North Georgia Mountains and we have been unable to capture more than one quarter of our view in one photo image. The view is literally as far as you can turn your head from one direction to the other, year round. Don't let the full moon's go to waste! They are truly awesome in this house! Lastly, be wary of a listing that does not show pictures of the view, it likely means that they don't have one worth showing. This listing shows three of the five photos required to take in the full panoramic view from Paramount Place. We would show more, but they only give us 16 photos and as it is a large home with lots of amenities, we need the other 9 to properly show the home. Tisha and Frank grew up in Northern Illinois and were married in 1993. Tisha is a high school teacher and Frank is a self employed Executive Recruiter. We have two children, Riley age 13 and Parker Age 11. We have two golden retrievers, Zeus and Percy. Paramount Place was our home when we first moved to Georgia and we live about an hour away, in the northern suburbs of Atlanta. We moved to Georgia after we completed the construction of Paramount Place in 1997. (we designed and built the home ourselves...) It was our primary residence for about 2 years. We moved closer to Atlanta to get our children into a neighborhood where there were more kids to play with. toilet, combination tub/shower, tub, jetted tub, Double whirlpool bath (huge) double shower. Well appointed, pretty much everything most people need. Easily accommodates 6 guest or more at one time. Nice layout for 6-10 people to enjoy a long weekend. We had a wonderful stay for my fiancé’s birthday. The views are outstanding and the home is well appointed and very private. The kitchen is very well equipped. Enjoyed a nice drive to Gibbs Gardens. Thank you for sharing your lovely home. Thank you for such a nice review. Hope to see you back again! Beautiful views. Floor plan is spacious. Loved the home but needs some maintenance and updating. Owner is responsive and reasonable. Just after 9 on our second morning in the house an employee from the power company arrived. He notified us that he was immediately cutting power to the house due to nonpayment. Not only did this mean no coffee and no heating for the house, but since the water pump runs on the house’s electric, we had no water pressure for showers or brushing our teeth. I quickly emailed the owner in the moments before the power was cut. He responded about two hours later. By that time we had vacated the house. This was our final morning in the house, so this could have been worse. Still, we paid quite a bit for each night plus his rather pricey cleaning fee, and we fully intended to have a comfortable morning in the house. With coffee. We also expected to leave having brushed our teeth. I have requested a partial refund but at this point, I’ve heard nothing. * you’d expect a house with such a nice fireplace to have a lighter or matches. It did not. I emailed Frank to ask if there were any matches in the house, but he never responded. Emailed because I had no cell service in the house and needed to rely on the house WiFi. * the match/lighter situation may seem minor, but given the cost of the rental it is telling. Also, the house is at best 20 minutes from a place where you could buy matches. Which brings me to the next point. * the check in materials Frank provides are extensive. Yet the information is incomplete or incorrect. He gives the name of the nearest grocery. You drive 20-25 minutes to get there and it is only a gas station. And you’re still 10 miles from town; you wasted time going to Frank’s suggestion when it would have been quicker to just go to town. Or he goes to lengths to tell you that if you mess up the cables for the home entertainment center that he will deduct from your deposit. Then he says there are instructions for the rather bafflingly system...but they are not included. * again, when a property costs this much per night, caring owners provide at a minimum travel shampoo and bars of soap for the shower. Not this house. Boy did I screw up. I changed bank accounts that the utility bills for this home are automatically paid from and forgot to notify the electric company. It was an hour and a half before I saw his email, not two hours. Immediately responded, called the utility company and paid the bill, and they turned the power back on within two hours. Then immediately texted Michael, apologizing and letting him know what had happened and that the power was back on. He was justifiably not happy and said he had left and would reach back to me once he return home. He never did. Instead he reached back to VRBO to file a complaint. VRBO asked me to reach out to him and see what could be done to make him happy. I called and left a message. He did not return the call. Waited three days, called again. Still no return. In good faith, left him a five star review. It was not his fault he was angry it was mine. As for the matches... I am sorry they ran out. They cost a dollar a box, and clearly Michael was out and about town. There is a gas stove and a lot of wood and kindling. Most guests would have been able to improvise. As for shampoo and soap. I have stayed in dozens of vacation rental homes that rent for more than mine, that do not provide personal soap and shampoo. No where does it say they are provided. The home theater system is a standard system. Plasma TV, Direct TV receiver, and an AV Receiver and DVD player. Most people can work this. We do leave instructions but sometimes they disappear, but I answer my phone when guests call or text and one more than one occassion have helped guests who were having trouble getting inputs lined up. As you can see by my other reviews, I try to provide a quality home and quality experience and I am very responsive. Clearly I screwed up, I deserve this review and I wish he would let me make it right, but he won't return my calls texts or emails so not much I can do here. Fortunately the two guests prior and the two guest after his stay lend some credibility to my statements that this was an honest mistake and I do my best for my guests. Sorry Michael, reach back to me and I will try to make it right for you. Beautiful home with a stunning view! Home fit for a King!! Really liked the place a lot. It certainly was what you see in the photos, light, bright, super great views. Three families from three different places drove here to enjoy the weekend. Prior to our arrival, the owner was responsive to questions, and provided very helpful information; he is a nice guy. We thoroughly enjoyed our stay and would not hesitate to stay again. This house has an amazing view of the mountainous region, covered with majestic trees. There are plenty of bathrooms for every guest, the living area is extremely roomy and comfortable, and the hot tub on the deck is fantastic. There was always something for everyone! Basketball, playground, hot tub, large porch, games, pool, foosball, and more! The house was super clean. Sam, the mountain dog, was so sweet. This is the BEST kitchen you could ask for. Table/bar settings for as many as 16!! Trying to decide...look no further...this is the place. There are lots of restaurants around however, once you get to the cabin, you won't want to leave. Paramount Place, its view and amenities and our overall experience during our stay there is FIVE STARS. Canoing, Rafting! Southern Terminus of Appalachian Trail is eight miles as the crow flies, ten miles to Amicalola Falls - Highest Waterfall in US East of Mississippi, 20 minutes from Lake Blue Ridge and Carters Lake, Whitewater Rafting and Canoeing is 5 minutes from the Caretcay River, 15 minutes from the Toccoa River, the Olympic Whitewater Facility is one hour away, Brasstown Bald is 45 minutes, Ideal Location to use as a base from which to explore the North Georgia Mountains! guests age 3 & under stay free of charge. Base rate for up to 6 guests. Cleaning fee increases if more than 6 guests. Pet fee of 20.00 per visit, (not per night) Additional pet deposit of 150.00 required for all pets. 7 night minimum stay XMAS/New Years/ThanksGiving/4th of July weeks. Last 3 weekends in Oct & 1st weekend in Nov have peak season premium of 200.00 per weekend. Waived if you are staying 4 or more nights.